Brachycephalic obstructive airway syndrome (BOAS) refers to a group of conditions that arise from the anatomical conformation of short nosed dogs and cats, known as brachycephalic breeds. Brachycephalic breeds have stenotic (narrow) nares (nostrils) and nasal passages. This results in increased resistance to airflow through the nares and nasal passages resulting in an increased effort to breathe. This increased negative pressure in the back of the throat in turn results in stretching of the soft palate. The end of the palate, known as the soft palate, is often excessively lengthened and thickened in brachycephalic breeds. This fleshy tissue is drawn into the larynx during inspiration and vibrates resulting in the classic snore or “stertor” made by brachycephalic breeds. This tissue can block the larynx reducing airflow to the lungs. Laryngeal saccules are sacs that are positioned just in front of the vocal folds in the larynx. The lining of the saccules evert (protrude) into the larynx due to the increased negative pressure generated by brachycephalic breeds during inspiration. These then block the opening to the airway further reducing airflow to the lungs. The larynx is a specialised structure that represents the opening of the trachea (windpipe). It allows air to flow into and out of the trachea and lungs during inspiration and expiration. It also prevents food and water from entering the trachea when swallowing and the vocal folds within the larynx allow dogs and cats to vocalise. Laryngeal collapse is an advanced form of brachycephalic airway syndrome that results from weakening of the cartilage that supports the larynx. Without this support, the larynx collapses. This reduces airflow, or completely prevents airflow to the lungs. Brachycephalic breeds may also develop problems with the gastrointestinal system. These may include regurgitation and vomiting. All brachycephalic breeds suffer from some degree of BOAS. The most common clinical history is noisy breathing, particularly on inspiration, with varying levels of respiratory distress. Less commonly, dogs may present due to acute collapse following exercise or over-activity. Brachycephalic breeds may also present due to frequent regurgitation or vomiting. A diagnosis of BOAS is suggested by the signs a cat or dog shows. However, a definitive diagnosis of BOAS is made during an upper airway examination under general anaesthesia. This allows the anatomical malformations to be observed directly. 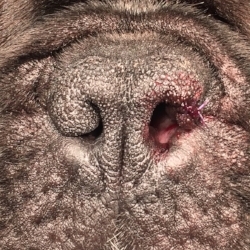 Brachycephalic obstructive airway syndrome is treated with partial resection of the soft palate (staphylectomy), nares and laryngeal saccules. These procedures reduce the amount of tissue blocking the flow of air to the lungs and improve the quality of life of BOAS patients. Unfortunately, a complete cure for this condition is not possible. Subsequently, a mild degree of noise while breathing may be retained.